Using Some Imagination To Teach Concepts. Cross a busy street with your eyes closed? 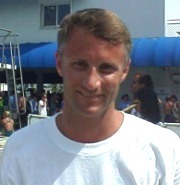 Derek Travis presents the principles of mechanics applicable to diving as described in " Diving Complete", in a condensed form for easy reference. By Herb Flewwelling of ESP Diving, EdmontonCAN. WHAT IS IT GOING TO TAKE TO WIN MORE THAN TWO BRONZE MEDALS IN 2000? Diving is Safe From US Diving's "Diving Safety"